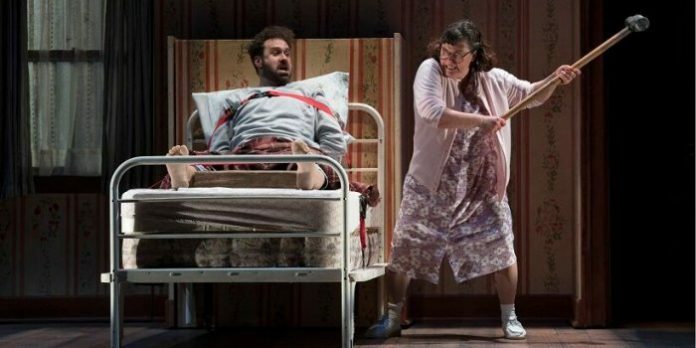 The Arts Club Theatre Company production of Misery is sometimes as schizophrenic as the play’s central character, Annie Wilkes. Suspenseful when it needs to be, darkly humorous to break the tension, it all comes packaged inside an inventive production design. Adapted from Stephen King’s 1987 novel, this stage adaptation was written by William Goldman, who was also responsible for the 1990 film, which garnered Kathy Bates an Oscar. A pretty faithful adaptation from novel to film to stage, Misery is the story of novelist, Paul Sheldon, who is kidnapped by his “number one fan”, Annie Wilkes, following a car crash. While nursing him back to health, Annie reads Paul’s latest book, a complete departure from the Misery Chastain romance novels he has written to this point. Deeming it to be filled with “cockadoodie” profanity, Annie’s wicked underbelly begins to emerge. Making matters worse, Annie’s dark side continues to manifest as she discovers Paul has killed off her beloved Misery, in what was to be the final edition of the series. On its surface, it all becomes an excuse for the ensuing cat-and-mouse game between Paul and Annie inside the remote cabin in which he is being held captive. Dig a little deeper though, and you discover this almost playful horror story is also a great big metaphor. “Misery is a book about cocaine. Annie Wilkes is cocaine. She was my number-one fan,” revealed Stephen King in a 2014 interview in Rolling Stone. But while King fans will be smug in this knowledge, and it does add some additional depth for those unfamiliar, the fact remains, Misery’s primary joys come from viewing it purely as a psychological horror thriller, albeit with a decidedly funny bent. Under the direction of Rachel Ditor it is the humour in Goldman’s adaptation which often takes centre stage. Horror fans may take umbrage in how much is played for laughs here, but for those looking for the creepier side of King’s story, it may be all about setting expectations. But really, it’s not the humour in Goldman’s script that drags down Misery, as much as the repetitive nature of the game being played out between the two. Goldman does try to break-up the monotony somewhat by having the local sheriff (Munish Sharma) stop by, but in the end it really only becomes an excuse for some special effects. 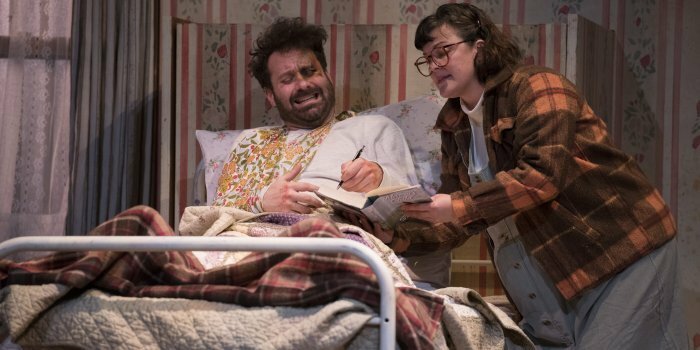 It’s hard to say if it would have helped, but when Misery played Broadway it was presented in 90 minutes without intermission, while this Arts Club production it is split into two acts, and 130 minutes. Annie Wilkes (Lucia Frangione) is novelist Peter Sheldon’s (Andrew McNee) “number one fan” in the Arts Club Theatre Company production of Misery. Photo by David Cooper. Much of what makes this Arts Club production sing comes from the very watchable performances from Andrew McNee and Lucia Frangione. As the hobbled novelist, McNee is up to the challenge of spending a great deal of his time stuck in bed. When he does venture out on the wheelchair Annie eventually provides, the tension is real. Watching him drag himself across the stage, or desperately try to make it back to his room before Annie gets home, are sheer delights. It is Frangione who excels here though, despite having to step into some mighty big boots, due to the inevitable comparisons to Kathy Bates Oscar-winning performance. Frangione need not worry as she holds her own, finding the necessary balance that makes Annie so creepy. But while both have the comedic chops for the surprisingly large amount of comedy, there are also moments of self-awareness that pull us from the story. There is a fourth character in this production: Laughlin Johnston’s ingenious set design. At first glance, the large wall-papered wall is that of an aging household. As the play progresses, openings emerge to reveal a kitchen, doorways, and windows, almost as if it was alive. Not only is it a brilliant way to represent the various rooms in Annie’s cabin, it is also a part of why Paul’s ventures outside the bedroom are as tension-filled as they are. Misery by William Goldman. Based on the novel by Stephen King. Directed by Rachel Ditor. An Arts Club Theatre Company production. On stage at the Arts Club Granville Island Stage (1585 Johnston St, Vancouver) until May 5. Visit http://artsclub.com for tickets and information.